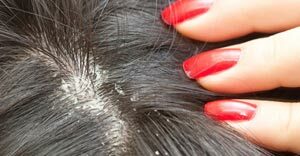 / Scalp Conditions - Adult / Do I have dandruff? If your scalp is scaling or shedding then it caused by the constant shedding of the outer layer of the skin. Just as the skin is continually being shed and replaced, the uppermost layer is being cast off at the same time. An infection or inflammation of the scalp and the reaction is characterised by reddening and the accumulation of fluid in the area. If the condition is chronic there is a thickening invasion from bacteria, viruses or fungi in or on the body which manifests itself as an infection, such as Seborrheoic dermatitis and eczema. Psoriasis, stress and dietary problems are recognisable by silvery white patches that are prone to bleeding if lifted off the scalp. Although tempting to peel these spots off, it’s advisable not to as they grow several times worse. Some Fungal disorders can first present themselves as scaly, for example, ringworm – (Tinea Captis), attacks any portion of the skin and is common in children between 4-10 years old, but adults are rarely affected. The hair is brittle, whitish and dull, depending on the stage of the disorder, and the skin is scaly. The disease is contagious in animals and people. If untreated in severe cases, it can result in permanent scarring. Infestations are a parasitic attack or subsistence on the skin by insects, mites or ticks. Head lice ( Pediculosos Capitis) usually starts at the base of the neck or behind the ears, and can cause acute inflammation. The shiny bumps/nits are easily recognised along the hair shaft because it is used as a depository for the eggs, although the instigators such as lice are difficult to detect, so therefore, the patient will merely complain of itching. Pruritus culminates in itching. This is not a disorder itself but a symptom of several conditions including infestations. It may vary from slight prickling sensations to intense burning – frost itch or winter itch is common in dry climates. The aged have a tendency to have a deficiency of oil in their skin that can incite pruritus senilis. Neurodermatitis, also known as irritant dermatitis is characterised by red, flaky patches and extreme itching which accompanies scalp spots. Scratching leads to the spread of the problem that consequently prompts the skin to have a leathery, discoloured appearance. Increased stress and tension can be the main origin of such a nervous induced condition. Styling can be stressful to the hair and scalp, with external sources being contributing factors which can lead to mechanical or chemical trauma, otherwise known as Traumatic Scaling. Harsh brushing/ combing, chemicals in shampoos, or likewise scalp preparations can all promote shedding. Dermatitis can develop if the condition becomes severe. The scales are often large, thin strips of epidermis (skin). The scalp can then become tender and sensitive to any future chemical applications, and even simple brushing and combing techniques will exacerbate the condition. If you’re worried about any scalp condition then it advisable to see a trichologist. All members are registered with the Institute of Trichologist and you can find one in your area by logging onto www.trichologists.org.uk. Otherwise ensure your scalp is clean by washing your hair regularly. Regular washing will ensure both your hair and scalp is clean which will resist a wide variety of disorders. Scalp manipulation stimulate the circulation of the blood to the scalp, soothe the nerves, stimulate the muscles and the activity of scalp glands, render a tight scalp more flexible and help maintain the growth and health of the hair. Be careful, massaging the scalp can sometimes have an adverse reaction in some people. Some scalp preparations containing moisturising and emollient materials help to preserve the health and beauty of the hair, and inevitably the scalp. They also assist in overcoming disorders such as dandruff. A treatment should be used when there is a deficiency of natural oil on the scalp and hair. Try to avoid strong soaps along with preparations containing mineral oil or sulphated oil base, greasy preparations, and lotions with high alcoholic content. Most scalp remedies, obtained from your GP usually contain a tar base or similar product which specifically cools the scalp but can be quite harsh and drying. The properties are synonymous with a face cleaner mirroring the strip away action of the dead cells. There’s no guarantee, but with regular treatment will certainly keep it under control. Many people often find that over-the-counter remedies treat the scalp but are drying. Using a good quality conditioner is a preferable alternative. Diet offers the best long-term solution. Cutting down on coffee and wheat based products as they are a catalyst for conditions such as psoriasis. Plenty of water (4-8 glasses) and a good multi vitamin with B Complex will prevent the scalp from becoming dry. Regularly eat oily fish such as salmon and mackerel as they are rich in omega 3 and 6 – essential fats that play a key role in the construction and maintenance of all healthy cells. If severe and not dandruff then seek professional advice. A trichologist deals with many conditions that affect the hair and scalp. Some dry scalp conditions can develop into inflammation that may require antibiotic treatment from your GP. In order to eliminate problems that occur, careful examination of the scalp should always take place with a Trichologist who bears the initials AIT (associate member) or MIT (Full member).